Lisa is ambitious and highly capable at her job. However she sometimes takes herself too seriously and is afraid to let her hair down on occasions. She has a determined nature and while she can cause friction, she is genuine and honest. Lisa makes her debut as a midwife in S4 E13, and it’s clear she has a volatile romance with colleague Mubbs. In S4 E14, Lisa treats a woman who’s having her fourth child. She thinks she has been pushed into having another baby as all her children have been daughters. In S4 E18, Mubbs and Lisa argue over a patient, and it’s obvious that things aren’t great with them. Mubbs later tells Ben that he has two tickets to go to the theatre on Valentine’s Day, and Ben (assuming that they’re for Lisa) happily tells her. When Lisa finds out that they’re infact for his mother, she dumps a cup of soup in his lap and declares that “This is us splitting up”. In S4 E19, Lisa and Steve, who have been flirting constantly throughout their organisation of the raffle, agree to meet up some time and it looks like romance could be blossoming. In S4 E20, Steve asks her on a date but later has to cancel when he has commitments to his son. In S4 E24, Steve tries to start a relationship with Lisa, but she decides against it, on Ben’s advice. In S4 E36, Lisa organises a charity auction of Holby’s eligible men. In S4 E42, Lisa has to move into the nursing quarters because the lease on her house has expired. She considers Mubbs’ offer to move into his spare bedroom although she really doesn’t think it’s a good idea. Luckily, Sandy has been nagging Danny about paying his share of the bills at their house so Danny invites Lisa to move in with them. Sandy is not impressed as she was hoping for a ‘male professional’ to fill Liam’s old room. In S4 E44, Sandy is still jealous of the attention Lisa is getting at the flat. In S4 E45, Lisa is forced to drive a pregnant woman into the hospital when she goes into unexpected labour but ends up driving into a passing jeep. No-one is hurt and they arrive in hospital before the birth. In S4 E46, Lisa pulls Mubbs again at Owen’s housewarming party. In S4 E47, Mubbs takes up Lisa’s joking invitation to meet her parents, and then begins to regret it as it turns into a “lunch from hell”, after which Lisa’s father ends up in A&E. In S4 E48, Lisa’s Dad, Terry, who has been staying at a B&B after splitting from his wife takes up Lisa’s offer of a night at her house. In S4 E49, Terry discovers she has a tumour but neglects to tell Lisa, who is happy celebrating her promotion. In S4 E50, Kath helps cover for Terry who is in hospital saying he has a ‘hernia’. In S4 E51, Lisa to tries to get Terry to reconsider his impending divorce, however he is getting friendly with Kath. In S5 E1, youths take off with Lisa’s new car after a terrifying carjacking. Leaving Lisa and her patient in labour stranded on a roadside. Lisa phones Mubbs who gives her advice but tells her not to carry out the procedure without proper medical equipment. Lisa’s phone battery runs out, but she carries on anyway. When they eventually arrive in hospital, a confident Mubbs performs in theatre. However, he spots to notice a crucial detail and Owen is called in. Mubbs takes the blame for Lisa’s actions, which impresses Lisa. Lisa publically humiliates Mubbs. She has an argument with him in the locker room, in front of many other members of staff. She realises that his being nice to her was just out of guilt, and asks him to stay away. In S5 E3, Lisa and Danny get drunk at Tom’s party and end up sleeping together. In S5 E4, Lisa and Danny wake up in bed together. Lisa seems to think that it’s the start of a new relationship, but Danny’s not so sure. Lisa says he needs to break free from Diane with whom he’s dating – when Diane comes bursting in. She’s clearly upset, and it’s awkward for both of them. Later Danny turns Lisa down. In S5 E5, Sandy accidentally starts a fire at their flat after a party. In S5 E6, a seriously angry Lisa tells Danny that Sandy hasn’t been paying the insurance payments, so they can’t claim insurance from the fire. She rages at Sandy calling her an idiot, but later apologises. In S5 E7, after seeing her dad kissing Kath, she is annoyed at how quickly he has moved on from her mother. In S5 E9, Lisa goes to visit Terry in his hospital bed and finds out that Kath’s been lying to her, he has cancer and he needs an operation. She immediately storms off to find Kath and blames her for her family splitting up. She says that she shouldn’t be kept in the dark, as she’s not a child anymore – and Kath tells her to stop acting like one then. When Ric operates he finds the cancer has spread so far it’s incurable. Kath and Lisa argue again, but are eventually united in their grief and upset. They both go and see Terry, and he’s pleased that the two women in his life are getting on. In S5 E10, Terry tells Lisa that he hasn’t long to live, she is devestated. In S5 E12, as Terry prepares to marry Kath. He asks Lisa to be his maid of honour. Terry also asks her to help him die if it comes to it, but Lisa is shocked and says she can’t. In S5 E13, Kath helps ease Terry’s suffering at the beach house at New Year. As he slips away, Lisa is at a party and kisses Danny, unaware of the news that will follow. In S5 E14, Lisa is in mourning but still goes to work. Later she visits Kath and they comfort eachother. In S5 E15, Lisa attends her father’s funeral. Lisa’s mother is angry when she finds out Kath will get most of Terry’s inheritance. In S5 E16, Lisa asks Mubbs how easy it would be to steal drugs from the hospital, and admits that she thinks Kath helped Terry die – it just seemed too perfect. Lisa says she’ll find out the truth, but Mubbs tells her just to get some grief counselling. Later she clashes with Danny and reports her fears to the police. In S5 E17, the police come in to question Kath. With some evidence, Lisa gives them permission to exhume Terry’s body to get any proof they need. Danny tells her it won’t bring him back. In S5 E18, it’s the day of Terry’s post mortem. Lisa is feeling guilty about if she did the right thing. Kath is later charged with his murder. Later Lisa and Danny clash again in the bar. In S5 E22, Lisa confides in Chrissie that she is falling for Mubbs again after all the support he has shown her. But she then sees CCTV footage of Mubbs and Jess together. By S5 E23, Lisa and Mubbs are at eachothers throats again. In S5 E25, Lisa attends an interview for AAU and later finds out she has got the job. In S5 E27, Lisa gives evidence against Kath at the court case. In S5 E28, Lisa asks her mother if she would have done what Kath did in her situation. She says no although her face reads different. Kath is later found not guilty of assisted suicide. Kath tries to explain herself to Lisa but she walks away. In S5 E29, Lisa is shocked after Ben and Steve are both involved in a car accident. Ben dies at the scene. Steve dies a few episodes later. In S5 E30, Lisa and Mubbs clash over the treatment of a pregnant woman with cerebral palsy. Later Owen and Mubbs give her a leaving present, but Ben’s death is still prominent in their minds. In S5 E31, Lisa begins her first shift on AAU and has to deal with a woman who tries to attack one of their patients – Lisa tackles her to the floor. In S5 E32, Danny tries to make it up with Lisa before he heads to Australia. Kath tries to give her money from Terry’s will but Lisa rips up the cheque in anger, saying it’s ‘guilt money’. She then proceeds to have a heated argument with Jess, but they later make up. In S5 E35, Lisa helps advise a pregnant patient who doesn’t want her mother knowing. In S5 E36, Lisa’s ex-boyfriend, David, is a patient on AAU – he was the father of the baby that she terminated. She invited him and his pregnant girlfriend to their house warming party. Lisa and Jess both vie for Nic’s attention – but Sandy is the lucky lady. Meanwhile David’s girlfriend goes into labour and they deliver the baby at the house. In S5 E46, Lisa becomes the new union rep leader. In S5 E49, the staff discover Sandy has won the lottery and headed to Australia. Lisa discovers Sandy has paid off her mortgage. Meanwhile, Lisa is horrified to learn Kath is returning to work and says she won’t make her life easy. In S6 E5, Nic is in jail accused of being the ‘Kellar killer’, when infact his sister, Kelly is the real culprit. Both Lisa and Jess are convinced he is innocent. In S6 E10, Ric has been living with Jess and Lisa since his gambling habit left him broke – Lisa finds Ric’s domestic habits hard to put up with and refuses to house his illegal plant. In S6 E14, Kath makes an effort with Lisa since it is the anniversary of Terry’s death. Lisa is hard towards her and ends up breaking down alone. In S6 E25, Lisa feels she is being officious when she reproaches Jess and Donna. She feels excluded from the girls and agrees to have a drink with Owen. In S6 E26, Kath leaves Holby for a new life with Larry. Her parting shot is with Lisa, to whom she confesses her part in Terry’s death. The pair share an emotional hug. In S6 E28, after weeks of flirting, Owen finally tempts Lisa by asking her back to his place and she cannot resist. In S6 E29, Owen and Lisa have been out for a night of heavy drinking and end up in bed. Their night is disturbed when Mubbs calls Owen to tell him that he is urgently needed for an operation. Even though he is still drunk, Owen goes in anyway. Lisa is shocked when she finds out he is on call and hurries to the hospital to plead with him to stop. Mubbs reluctantly decides not to report Owen when Lisa points out that his own track record is less than perfect. Lisa’s relationship with Owen is shortlived. In S6 E34, Donna is late for work and is not pulling her weight. She thinks having her flatmate, Lisa, as her new boss will give her an easy ride. But when she disobeys orders and a patient goes missing, Lisa loses her temper and reprimands Donna for her behaviour. Lisa realises that being liked is less important than being effective and she declines the offer to go for drinks with Jess and Donna, opting to work late instead. In S6 E42, Donna is behind on her rent, and Lisa is fed up with her lies and attitude at work, so she tells her to move out – that night. With nowhere else to stay, a tearful Donna ends up spending the night in the relatives’ room. Next episode in S6 E43, Donna confides in Chrissie, who gets Lisa to have a change of heart. In S7 E2, Mickie comes to work with a bruise on her face and tells Lisa that she took drugs and was attacked. Lisa is shocked but understanding, blaming Donna for giving her the pills and for abandoning Mickie when she was in need. Lisa tells Mickie that she no longer has to sleep on the sofa and offers her Donna’s room. 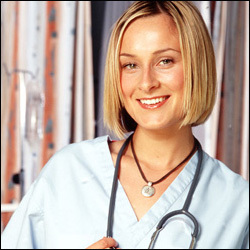 In S7 E7, Connie tells Lisa that she did not get the job of Clinical Matron as she was too inexperienced. However, when the original candidate declines the offer, Lisa is given the job on a trial basis. In S7 E8, Lisa passes her trial as Clinical Matron despite a disastrous day. She tells Connie she will accept the job on one condition – that she can run the ward her way. Connie agrees to this. In S7 E16, A Health Minister is visiting the hospital that day and Connie wants everything to run smoothly. Lisa returns from her management course full of ideas. She wants to start an NHS mentoring scheme. Lisa asks Mickie is she wants to be mentored by her, Mickie agrees. Lisa tells Connie she will talk to the Minister about the mentoring scheme when he arrives. During an operation Connie complains to Will that Lisa is too ambitious and that she is going to mentoring Mickie. Connie tells Lisa that Mickie’s aspirations are higher than ward management and therefore she will be mentoring her instead. Lisa is not amused. In S7 E17, Mickie is shadowing Connie. Lisa and Connie clash when Lisa insists Mickie is not qualified to assist with a procedure. Connie ignores Lisa and allows Mickie to work with her. Bailiffs turn up at the girl’s flat as Donna hasn’t kept up her loan repayments. Donna lets them take the TV and other belongings – she does not tell the bailiffs that the possessions are in fact Lisa’s. In S7 E19, Lisa comes back from holiday to find that her possessions have gone – Donna confesses all. In S7 E20, Lisa is furious with Donna and tells her she had to pay £500 to get her belongings back. She says Donna can earn the money back by being in charge of AAU. Donna finds the experience stressful and learns a valuable lesson about management. In S7 E27, [ID 1443]Mark[/ID] has an argument with Chrissie and goes for a drink with Lisa instead. They continue to flirt in S7 E28. In S7 E30, Mark plans to take Chrissie to the ball to make amends but she refuses. Thinking he has a spare ticket, he asks Lisa. Later, Chrissie finds out that Mark is taking Lisa and is furious. Lisa says she does not want to get caught in the middle and tells Mark to take his daughter.